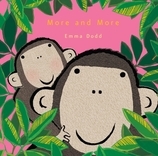 The love between parent and child grows by the day, as one little monkey discovers in this gorgeous story from Emma Dodd. Stunning illustrations of a monkey family and foil-embellished pages make this the perfect book for parent-child bonding at bedtime. A little monkey learns that his parent loves him more and more every day.